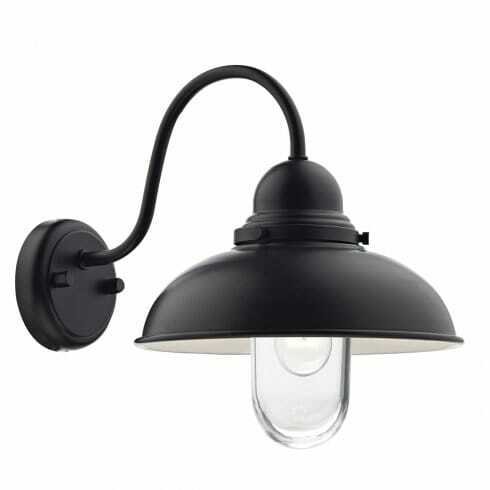 Dar Lighting Dynamo single light wall fitting displays an external lantern with a wide, domed shade in an antiquated style that would have traditionally been seen adorning factories and commercial spaces. The product code for this Dar wall fitting is DYN0722. The black finish encapsulates the time-worn spirit of this exceptional outdoor lantern which certainly add much personality and interest into more traditional external settings. IP44 rated making this suitable for outdoor use. Also available in aged iron finish and the extensive Dynamo range is also available in a wide variety of ceiling pendants, wall fixtures and table and floor lamps an assortment of colours from pink and blue to polished chrome and antique brass.